Argentina, the second-largest country in South America, is known for its gauchos (cowboys), its huge steaks, its excellent wines, and the invention of the tango. Well sample all of these during our three-night stay in Buenos Aires  sophisticated, cosmopolitan and the most European of the South American capitals. With its wide tree-lined avenues, caf culture and upmarket boutiques, Buenos Aires cannot fail to surprise and delight you. Iguazu Falls may not be as well-known as Niagara or Victoria Falls, but it outshines them all in its sheer scale and majesty! Spanning the border between Argentina and Brazil, each side has its own particular attractions. Dont miss the chance to experience the falls from below on our exciting optional jetboat trip. And finally, theres Rio, arguably the most spectacularly sited city on the planet. The Cidade Maravilhosa, or marvellous city, is an intoxicating fusion of samba rhythms, vast stretches of beaches, beautiful people, lush forests and extraordinary granite peaks. Somehow everything seems bigger, brighter, louder and more colourful when youre in Rio! We stay at the northern end of Copacabana beach, from where the wide swathe of the whole bay stretches before you. Copacabana and its sister, Ipanema beach, are the playgrounds of the city and the people-watching is simply fascinating. 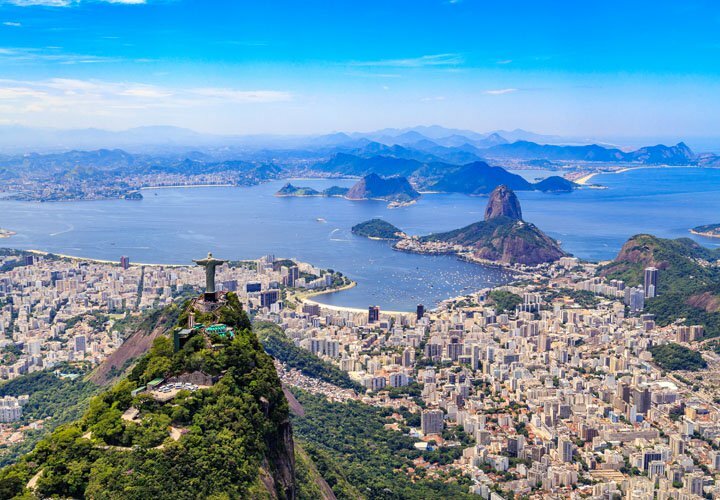 Of course, well also get to the top of two of Rios most famous peaks, Sugarloaf Mountain and the Corcovado peak with its awe-inspiring 100ft statue of Christ the Redeemer. Needless to say, South America is a vast continent with a huge variety of incredible places to see and things to do, which are simply impossible to cover on one trip. We have hand-picked the real stand-out experiences that encapsulate the culture, history, cuisine, monuments and scenic wonders in this once-in-a-lifetime, two-country tour. Arrive at the airport for your overnight flight to Buenos Aires, via S£o Paulo. We land in Buenos Aires, Argentina. Our hotel for the next three nights with breakfast is the centrally located four-star 725 Continental. After breakfast, we drive out of the city to the Pampas plains to the west of Buenos Aires. Our destination is the Estancia Santa Susana, originally created by Irish migrants and today still a working ranch spread across almost 3,000 acres. The original house is beautifully preserved and gives a fascinating insight into life here during the late 19th century. The ranch has plenty of horses and in true gaucho tradition, youll see them showing off their equestrian skills. An excellent lunch is included featuring Argentinian beef on the barbecue, which you can enjoy with local songs and dances. Today we explore the fascinating metropolis of Buenos Aires. Known as the Paris of South America, with its wide tree-lined avenues, squares, parks and grand public buildings, it exudes an unmistakable style. Well visit the Plaza de Mayo and the pink-coloured Presidential Palace, from where Evita Peron used to speak to huge rallies. Well see the colourful barrios (districts) of San Telmo and La Boca, and also visit Recoleta Cemetery to see Evita Perons final resting place. This evening we enjoy a visit to one of the citys best tango shows, with dinner included. The Argentinian side of the falls is known for its numerous viewpoints over the many small and large falls, which are easily accessed by wooden boardwalks through the lush forest surrounding the falls. We also catch the charming open-sided jungle train to the head of the falls. For the more adventurous, there is the option to take a jetboat ride to the foot of the falls on the Iguazu river  you will get seriously wet! We cross the border to the Brazilian side of the falls, visiting the stunning Devils Throat balcony viewpoint, where you are literally surrounded by falling water! Theres also the option of arranging a helicopter flight over the falls. In the afternoon, we take the short flight to Rio de Janeiro, where we stay three nights with breakfast at the new three-star superior Arena Leme Hotel, perfectly located right on Copacabana beach. All our rooms have stunning sea views. Today we visit the statue of Christ the Redeemer, one of the highlights of the tour. Reached by a Swiss-built cog railway through the Tijuca Forest National Park, the granite peak stands at 2,300ft, with the statue itself a further 100ft tall. The views in all directions are simply outstanding. On return to sea level, we take a walk through Rios charming Botanical Gardens before our included lunch of Brazilian barbecued meats (a vegetarian option is available). This morning we board the breathtaking two-stage cable car to the top of Sugarloaf Mountain, which overlooks some of Rios most spectacular bays and beaches. We follow this with a tour through the centre of Rio and an included lunch at one of the citys most iconic restaurants, the beautiful belle-poque Confeitaria Colombo. Transfer to the airport for your return flight via S£o Paulo.